THE B-MOVIE NEWS VAULT: New DVDs & Blu-rays for 04/05/2016! New DVDs & Blu-rays for 04/05/2016! Sorry for the lateness of this post Vault Dwellers. I took a brief break from all things Vault-related because my employer of eleven years lost his hard-fought battle with pancreatic cancer after a brave, nineteen-month struggle. (R.I.P - Rob Robinson) He was a good man that treated my coworkers and I like family. And though we didn't always see eye to eye, or share many interests, he always had my back and readily offered a helping hand. But the time has come to move forward, and get back to the daily grind. 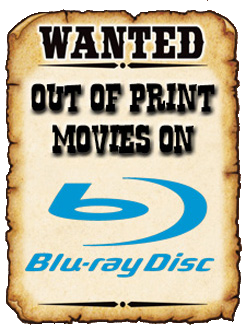 And what better way to do it than by telling you all about the DVDs & Blu-rays that came out this past Tuesday? By far the most important title to be released this week is easily STAR WARS: THE FORCE AWAKENS! It's an enjoyable trip back to the galaxy far, far away that many of us grew up with, and has me eager to watch all future additions to this unstoppable Disney franchise! Not in the mood for a space opera? Well several genre distributors have got you covered! Scream Factory gives us a double dose of high-def Horror with THE HALLOW and #HORROR, while Arrow Video delivers a triple threat of new releases that you will want on your shelves at home: THE BLACK CAT (1981), DEATH WALKS TWICE: THE FILMS OF LUCIANO ERCOLI (which includes DEATH WALKS AT MIDNIGHT and DEATH WALKS ON HIGH HEELS), and YOUR VICE IS A LOCKED ROOM AND ONLY I HAVE THE KEY! If none of those titles excite you, and you happen to enjoy anime, there's plenty too choose from this week, including the new GHOST IN THE SHELL movie, Part 2 of MOBILE SUIT ZETA GUNDAM saga, and PARASYTE: MAXIM COLLECTION 1! There's also a several bargain-priced DVD boxed sets, and a few cool direct-to-DVD titles (THE HOARDER looks promising), so there's plenty of options for you this week! The Half-Life Horror From Hell or Irradiated Satan Rocks the World! Contains: Creatures the World Forgot, The Revenge of Frankenstein, Never Take Candy from a Stranger, Maniac, The Snorkel, and Die! Die! Darling! New DVDs & Blu-rays for 04/26/2016! New DVDs & Blu-rays for 04/19/2016! New DVDs & Blu-rays for 04/12/2015!